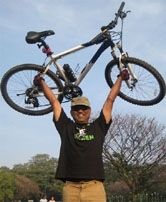 GoGreen Campaign Ride towards Malleashwaram & Srirampura 11 Apr 10 - GGI-Group size: 4000+ Professionals, Increasing on day to day basis, Come & join us 2 serve Mother Nature. City Library - High Court - Vidhan Soudha - Raj bhawan- Chalukya Hotel - Race course Road - Shashadripuram shivananda stores - under railway bridge - Natraj Theater - Mantri Mall - Sampege Theater - Sreerampura - Sampage Theater - Malleashwaram Main Road - Laxmi Narashima Swamy Temple. Names of Participants reading from left to right. 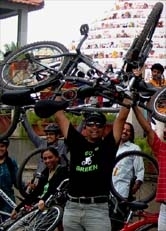 3rd Row : Karan, Sahil, Shantu, Kumaran, Vasu, Srikanth, GoGreen Rao. 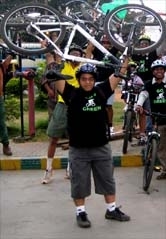 Newbies who has joined the GoGreen Campaign Ride. GGI-Group Photograph @ Malleshwaram Temple. Sankar's Dad & Mom along with GGR @ Sankar house.